Stoneham's claim to fame in the 19th century was as a shoe town. This heritage is reflected in the Town Seal, featuring a shoe, a peg hammer and a goat -- because kid (goat) leather made the finest shoes. The town grew very rapidly in the 19th century as shoemaking, long a town tradition, shifted from sole proprietors making a few pair in their spare time, to the factory system. In 1825, Stoneham only had 70 houses, The population by 1840 was just over 1000, and just under 5000 in 1875. Along with dozens of shoe factories, there were enterprises supporting the shoe industry, such as heel makers, tanneries and cardboard box manufacturers. ​In 1837, Stoneham produced over half a million pairs of shoes and shoemaking employed over half the town's workers. In 1890, Stoneham produced over a million pairs of shoes. Once on Franklin Street, look to your left again. The Jones Factory (pictured above) once stood where the Fuller Street parking area is today. Opened in 1890 as the last large shoe factory in Stoneham and razed in 1939, it employed almost 300 hands and could produce over a quarter of a million pairs of women's and children's shoes a year. While the factory is gone, the 1878 family home of its owner Thomas Jones is still standing on Warren Street and is listed on the National Register of Historic Places. Both were built by John Spencer, a local housewright. ​Next, continue down Franklin to the Fuller House (32 Franklin). ​William Griffin Fuller, owner of a local leather business, built the house at 32 Franklin Street in 1850. He lived the Greek Revival/Italianate home until his death. His daughter left the house to a local civic group, who remodeled it and in 1930 opened it as a "Home for Aged People in Stoneham." In 1938, the matching addition was added on the left and the home continues to house older residents of the community even today. ﻿Continue walking south on Franklin. At Franklin & Pine sits the Franklin Street Depot, which was the end of the Stoneham Branch line of the Boston & Maine Railroad. Opened in 1843, the railroad, originally the Boston & Lowell, was a replacement for the Middlesex Canal which ferried passengers and freight from the Mystic River to Lowell's factories on the Merrimack River. 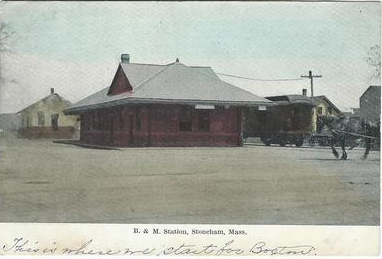 The Stoneham Branch line, which opened in 1861, carried passengers until 1959. Its right-of-way is being converted into a pedestrian and bike trail. You will now turn down Pine Street. ﻿﻿﻿As you walk along Pine Street, the location of the Tidd Tannery is on your right about where the DPW buildings are - all the way to Gould Street. 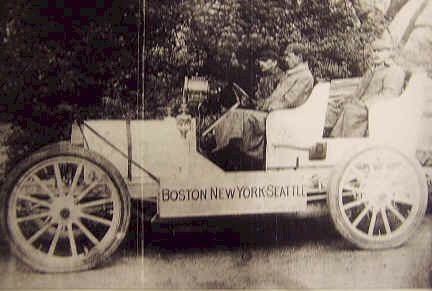 On the left side of Pine were additional factory buildings, including the location of the Phelps and Shawmut car factories. 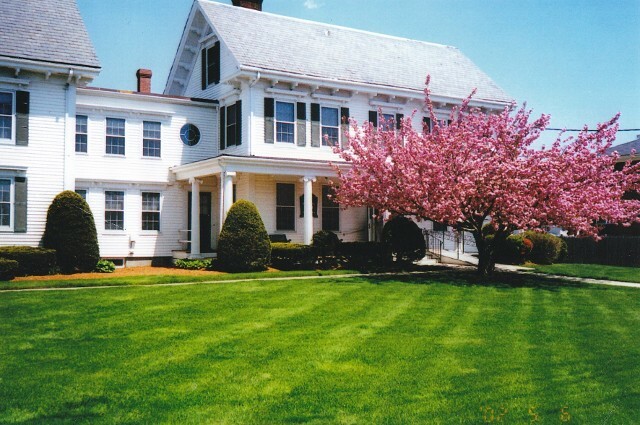 As you walk further down Pine, you will see two very different homes from figures who loomed large in 19th century Stoneham. Silas Dean (b. 1815) had a long career as Town Clerk. 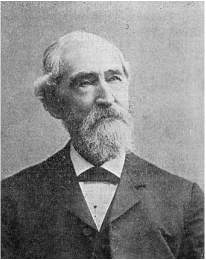 He was also an auctioneer, historian, justice of the peace, educator, merchant and deacon of the First Congregational Church. His wife Sarah wrote poems in honor of Old People's Sunday and started the Dean Sunday School class at the church. For several years in the 1840s, Dean ran a school from this building and had an office here as Town Clerk for over 40 years. His History of Stoneham was published in 1870. 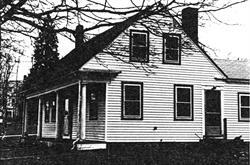 The house, built in 1840, is on the National Register of Historic Places and is one of several Greek Revival cottages scattered throughout Stoneham. The cottage type has a front roofline which extends to create a porch on the front facade. ﻿This property, dating to 1865, is a fine example of the Italianate style that was favored by Stoneham factory owners in the 19th century. Its owner, R. P. Turnbull, would have had only a short walk down the street to the William Tidd & Co. tannery and currying shop where he was a partner. The tannery was the largest in Stoneham and its complex stretched along Pine Street from Gould Street almost all the way to the train depot. Tidd Street, named after the firm, once ran from Pine to Central streets about where the Police Station driveway is and was removed for the construction of the Town Hall in the 1930s. His partner William Tidd's estate was on the corner of Hancock and Main Streets. All that remains now are the driveway entrance gates. As you come to the end of Pine Street, cross Pleasant and turn (east) right on Pleasant Street toward your next destination: The Old Burying Ground.